Fund My Mutual Fund: The Economist: A Glimmer of Hope? 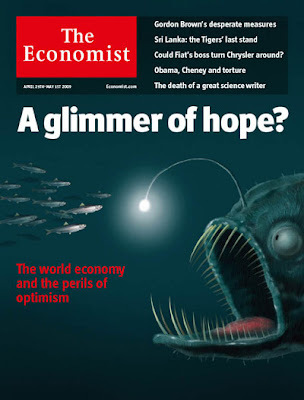 The Economist: A Glimmer of Hope? I wanted to post snippets from this week's cover story of The Economist just for cover art alone - I love it. Just love it. Obviously this sums up my thought process as we enjoy the "paper printing prosperity" (P-cubed) where so much money is thrown at the system, a parallel economy of fiat money props figures, while hiding the ugly beneath. Setting us up for the dropping of the Emporer's clothes later in 2009 or early 2010 ... and even if we do "get there" (recovery) I believe the shape and scope of it will disappoint those waiting on the other side. The type of damage for the world's driver (the US consumer) is on a scale people simply are glossing over. THE rays are diffuse, but the specks of light are unmistakable. Share prices are up sharply. Even after slipping early this week, two-thirds of the 42 stock markets that The Economist tracks have risen in the past six weeks by more than 20%. Different economic indicators from different parts of the world have brightened. China’s economy is picking up. The slump in global manufacturing seems to be easing. Property markets in America and Britain are showing signs of life, as mortgage rates fall and homes become more affordable. Confidence is growing. A widely tracked index of investor sentiment in Germany has turned positive for the first time in almost two years. The second slump is in the emerging world, where many economies have been hit by the sudden fall in private cross-border capital flows. Emerging economies, which imported capital worth 5% of their GDP in 2007, now face a world where cautious investors keep their money at home. According to the IMF, banks, firms and governments in the emerging world have some $1.8 trillion-worth of borrowing to roll over this year, much of that in central and eastern Europe. These crises sent the world economy into a decline that, on several measures, has been steeper than the onset of the Depression. But the collapse has been countered by the most ambitious policy response in history. Central banks have pumped out trillions of dollars of liquidity and, in rising numbers, have resorted to an increasingly exotic arsenal of “unconventional” firepower to ease credit markets and loosen monetary conditions even as policy rates approach zero. ... action on the current scale has never been tried before and nobody knows when it will have an effect—let alone how much difference it will make. Whatever the impact, it would be a mistake to confuse the twitches of an economy on life-support with a lasting recovery. A real recovery depends on government demand being supplanted by sustainable sources of private spending. And here the news is almost uniformly grim. Take the country many are pinning their hopes on: America. As the inventory adjustment ends and the stimuli kick in, America’s slump is sure to ease. Cushioned by the government, the economy may even begin to grow again before too long. But it is hard to see the ingredients for a recovery that is robust enough to stop unemployment rising. Weakness abroad will crimp exports. America’s banks are propped up with public capital, but their balance-sheets are clogged with toxic assets. Consumer spending and firms’ investment will be dragged lower by the need to pay back debt and restore savings. This will be a long slog. The outlook should in theory be brighter for Germany and Japan. Both have seen output slump faster than in other rich countries because of the collapse in trade and manufacturing, but neither has the huge private borrowing of the sort that haunts the Anglo-Saxon world. Once inventories have adjusted, recovery should come quickly. In practice, though, that seems unlikely, especially in Germany. As the output slump sends Germany’s jobless rate towards double-digits, it is hard to see consumers going on a spending spree. Nor has the government shown much appetite for boosting demand. Germany’s fiscal stimulus, although large by European standards, falls well short of what it could afford. Worse, the country’s banks are still in trouble. Germans did not behave recklessly, but their banks did—along with many others in continental Europe. Japan has acted more boldly. Its latest package of tax cuts and government spending, unveiled in early April, will provide the biggest fiscal boost, relative to GDP, of any rich country this year. Its economy is likely to perk up, temporarily at least. But its public-debt stock is approaching 200% of GDP, so Japan has scant room for more fiscal stimulus. With export markets weak, demand will soon need to be privately generated at home. But the past two decades offer little evidence that Japan can make that shift. For the time being, the brightest light glows in China, where a huge inventory adjustment has exaggerated the impact of falling foreign demand, and where the government has the cash and determination to prop up domestic spending. China’s stimulus is already bearing fruit. Loans are soaring and infrastructure investment is growing smartly. (I contend a lot of these loans will go bad in a few years since the end demand is simply not there and we have overbuilt areas that are simply seeing more building - but that's a problem for them I suppose, not us as stock speculators) Yet even China has its difficulties. Perhaps three-quarters of the growth will come from government demand, particularly infrastructure spending. The worst is over only in the narrowest sense that the pace of global decline has peaked. Thanks to massive—and unsustainable—fiscal and monetary transfusions, output will eventually stabilise. But in many ways, darker days lie ahead. Despite the scale of the slump, no conventional recovery is in sight. Growth, when it comes, will be too feeble to stop unemployment rising and idle capacity swelling. And for years most of the world’s economies will depend on their governments. When you really sit back and think about it - so much of the world economy was built on Americans overspending. Hence you see the solution by the government - drive down rates even lower than the Greenspan era that got us here, make money even cheaper, and ask Americans to do it one more time. A lot of my theories for the intermediate term are based on Americans acting in self preservation and not making the exact same mistake twice within a decade. But as always, I could be wrong and underestimate the quench to not think about the future and spend like drunken sailors with money fellow citizens don't have. Consider what that means. Much of the rich world will see jobless rates that reach double-digits, and then stay there. Deflation—a devastating disease in debt-laden economies—could set in as record economic slack pushes down prices and wages, particularly since headline inflation has already plunged thanks to sinking fuel costs. Public debt will soar because of weak growth, prolonged stimulus spending and the growing costs of cleaning up the financial mess. The OECD’s member countries began the crisis with debt stocks, on average, at 75% of GDP; by 2010 they will reach 100%. One analysis suggests persistent weakness could push the biggest economies’ debt ratios to 140% by 2014. Continuing joblessness, years of weak investment and higher public-debt burdens, in turn, will dent economies’ underlying potential. Although there is no sign that the world economy will return to its trend rate of growth any time soon, it is already clear that this speed limit will be lower than before the crisis hit. But other than that? Everything's super. Or will be. In 6 months. Just trust us.